Migrant workers choose and cut off yellow squash at Kirby Farms in Mechanicsville, VA in 2013. 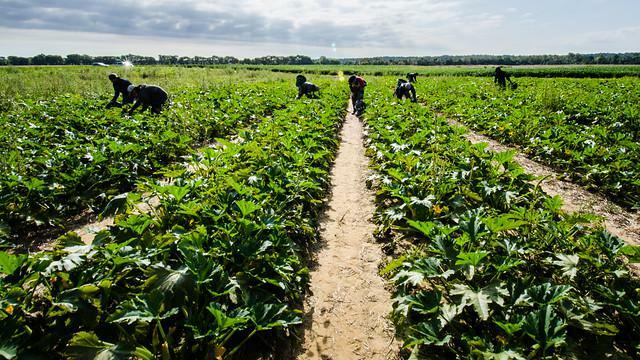 Host Frank Stasio talks to Caitlin Ryland, the supervising attorney for the Farmworker Unit at Legal Aid of North Carolina about labor trafficking in our state. Employers can petition for this visa to hire foreign workers for temporary agricultural work, however these particular workers reportedly experienced illegal pay, constant threats, substandard housing and lack of medical care. The defendants denied liability, but have since received lifelong bans from participating in the H-2A program. Host Frank Stasio talks to Caitlin Ryland about this case and the larger concerns of labor trafficking in North Carolina. Ryland is the supervising attorney for the Farmworker Unit at Legal Aid of North Carolina. The toll-free National Human Trafficking Hotline is 1-888-373-7888.